I noticed on a recent infographic comparing the habits of wealthy people to poor people, that 88% of wealthy people read at least 30 minutes a day compared to 2% of those in poverty. Reading has also been one of my lifelong habits (30 or more minutes each day since I was 18.) It didn't make me wealthy, but it continues to enrich my life. Liking the book, The Antidote, about which I blogged recently, Jay Zenner, a long time friend, fellow Stoic and author of a book and blog on the evolution of real estate marketing, recommended a book by Max Gunter that was first published in 1986 and now out as an eBook entitled How To Get Lucky. Not that kind of lucky. Stay with me for a minute. While debunking various myths by “successful” people on how they achieved their success, it reveals something else Bill Gates and I have in common. “Luck played an immense role. Some of it came after I entered the business world, but my lucky streak started much earlier than that. But as a 2011 New York Times op-ed by Jim Collins and Morten Hansen noted, based on their study and book entitled, Great By Choice, for Gates and others, luck was just the spark. “First, some significant aspect of the event occurs largely or entirely independent of the actions of the enterprise’s main actors. 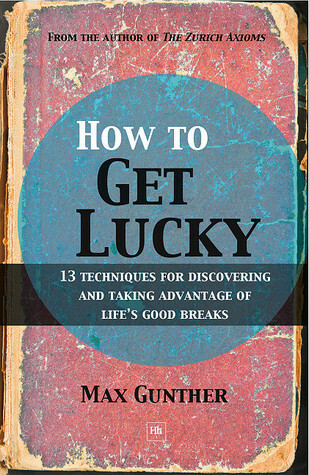 While Great By Choice is a good read and includes some interesting background about successful people, I too am drawn more to the “13 techniques” in How To Get Lucky, “for discovering and taking advantage of life’s good breaks. One of my favorite techniques in How To Get Lucky is #1, “making the luck/planning distinction.” He concludes this chapter with the profound statement that “the first step in controlling your luck is to recognize that it exists.” This, I presume, is when it is most likely to be a spark. Many who are unwilling to acknowledge the role of luck in their success fail to understand that its recognition is a position of strength. Failing to accept and recognize the role of luck in our lives is a weakness.